I cannot understand how so many historians can take this letter at face value without subjecting it to any form of critical analysis and declare it a matter of "historical record" that is capable of of rewriting history. The following is a presentation of my views regarding the letter and the many questions it elicits. the prosecution failed to establish a motive. When George Witton visited my late grandfather to give him a copy of Scapegoats of the Empire he informed him, according to my mother, that the book had been withdrawn from circulation due to the intervention of the British Government. (This was told to me long ago by my late mother, I don’t know any more details). The book was still available in April, 1909 so I suspect that its withdrawal may have occurred shortly afterwards and may have had something to do with Kitchener’s impending visit at the end of that year. With a war against Germany becoming more and more inevitable it wouldn't do to have a book in circulation that highlighted Kitchener's treachery just when he's trying to drum up future support for the good old mother country. In the 1929 letter Witton twice mentioned Handcock’s alleged confession so it was obviously worrying him. I admit that this is pure speculation but the possibility exists that he was threatened with the release of that “confession” and its likely consequences. After all, as he stated in the letter, he believed that the confession implicated him in the shooting of Heese - and nobody had yet been convicted of that crime. Why did the book suddenly disappear from sale? If, as has been suggested, the authorities bought up all the remaining copies, wouldn’t that have been an incentive to print more? Unless, of course, some means were used to dissuade Witton from doing so. I had read so many conflicting accounts about why Witton’s letter was withheld until 1970 that I was determined to find out the true story. After viewing the microfilm copy in the Mitchell Library [Am77/8] I asked a member of the staff if it was possible to find out when the document was actually received and under what circumstances. The original of the letter has a fine notation along the left hand edge of page 1 stating that it is from the estate of J.F. Thomas and is dated 11 October 1945. This notation did not show up on my microfilm copy and I am grateful to the member of the library staff who kindly retrieved the original for my perusal. Do not know if this is of any interest to Mitchell Library. The letter gives information re Hancock [sic] that is new to most people. 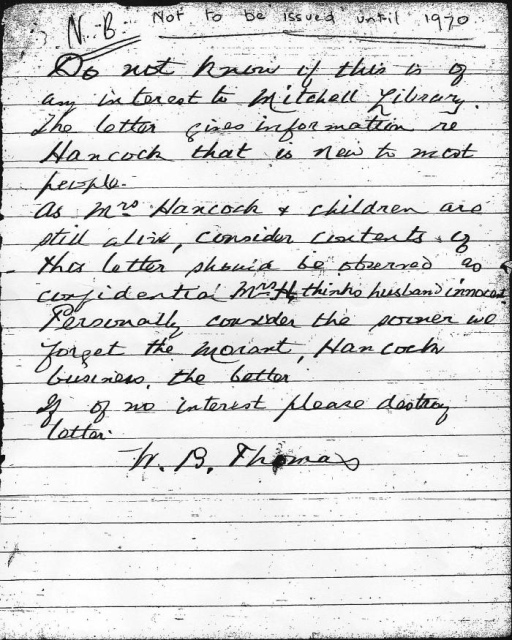 As Mrs Hancock & children are still alive, consider contents of this letter should be observed as confidential. Mrs. H thinks husband innocent. Personally consider the sooner we forget the Morant, Hancock business the better. If of no interest please destroy the letter. What disturbs me even more is that Shields actually shows the bottom part of this covering note in his filmclip but still claims that it was sent to the Mitchell Library by James Francis Thomas. Personally I think the attitude you take with regard to Morant and Handcock and the Heese case is not the right one. I am inclined to think that neither of them took you into their confidence over that case. Up to the time of the Court of Inquiry when I was charged with complicity in his death I had no more knowledge of how Heese came by his death than the babe unborn nor did I have at anytime the slightest suspicion that Morant or Handcock was connected with it. It staggered me at the time but my statement in reply I think cleared me of that count at that inquiry. Subsequently when we were allowed to see each other Morant told me that Handcock had broken down and confessed to everything including shooting Heese. I believe Morant got Handcock to deny his previous statement in which he had made a clean breast of everything and they got to work to frame up an alibi which you know was successful and the means of their acquittal. But you must not forget Kitchener held Handcock’s ‘confession’ in which he implicated me as an accessory no doubt unwittingly done while in a high strung nervous state but that accounts for the reason why only Morant Handcock and myself were punished and the War Office so adamant in my case. Had there been no Heese case the shooting of prisoners would not have worried them much. But the shooting of Heese was a premeditated and most cold blooded affair. Handcock with his own lips described it all to me. I consider I am the one and only one that suffered unjustly (apart from yourself). Morant and Handcock being acquitted my lips were sealed. I would very much like to peruse the evidence of the Heese trial although I took no part in it or was present. If you have a copy and would care to send it to me I would take particular care of it and return it safely. Personally I do not think there would be much in writing what you term the true story of the Bushveldt Carbineers in face of the fact that the War Office may still hold Handcock’s confession. "…as to the death of the missionary, it was quite a mystery to me, but I was confident that it could not be charged to the Carbineers. Some writers, including Craig Wilcox , and Carnegie and Shields, have seized upon the 1929 letter as proof of the guilt of Handcock and Morant in the murder of Rev. Heese. Arthur Davey also implies guilt but questions Witton’s “general credibility” . Kit Denton mentions the letter but draws no conclusions. Nick Bleszynski , Bill Woolmore and Graham Jenkin provide a more balanced assessment. While acknowledging the possible implications of Witton’s letter they also point to the disparity with his earlier remarks and raise questions about his motives and state of mind at the time of writing it. Witton says that his “lips were sealed” but if he genuinely believed that Handcock was guilty of a “premeditated and most cold blooded” murder then why, 22 years earlier, did he express his astonishment that Handcock had been charged? Why not simply omit any reference to Handcock’s involvement, or lack thereof, from his book? Witton knew he wasn’t standing beside Morant and tells Thomas so in the letter. Surely if Handcock was about to commit a cold blooded murder he would remember who was present to witness his intentions. Bear in mind that on the day Heese was shot Handcock had known Witton for less than 3 weeks so I feel sure that if such a conversation took place Handcock would surely remember the participants. So the remark doesn’t make any sense if read the second way either. Is there another explanation? The prisoners were kept isolated from one another before and during the courts-martial. Witton wrote that they were allowed to speak to each other for the first time on the day before the courts-martial began. Morant was the first one he spoke to on that day and this was the first time they had spoken since their arrest. It must have been then that Morant told him that Handcock had “broken down and confessed everything”. Could it be that Morant believed Handcock confessed because that was what he was told repeatedly during his interrogation? Witton described the court of inquiry as a “Star Chamber” (p74) and on p77 claimed that tactics such as bullying and badgering of witnesses were used. Their commanding officer, Major Lenehan claimed that attempts were made to get Morant and Handcock to perjure themselves and implicate him and that attempts were made to intimidate the BVC adjutant, Lt Edwards, into giving evidence against Lenehan. Likewise, is it so unbelievable that during attempts to coerce a confession from Handcock he was told something like “you may as well confess – Witton has told us that he was there when Morant ordered you to follow the missionary and shoot him”? This could account for Handcock’s strange retort when confronted by Witton and it is possible that due to their limited opportunity for interaction they never resolved the issue. I very much doubt Witton would have raised it again later. I find it highly unbelievable that on the day before he was to go on trial for several murders he would not only confess but describe all the details to someone he had known for such a short time. Witton could have realised the irony in Handcock’s response at the time but the years may have clouded his thinking with the words taking on a new meaning, or led to flaws in his memory as I will discuss later. In his memoirs Intelligence Officer, Captain F.R. de Bertodano claimed to be “the man who worked up all the evidence” against the Carbineers . Given his reputation for “righteous zeal and disreputable methods” when dealing with prisoners it is possible that he conducted his own inquisition while the Court of Inquiry was in progress and throughout the several weeks between when it concluded and the trials began. The prisoners remained isolated from one another during that period. It may have been de Bertodano who badgered Handcock into believing that Witton had implicated him in the Heese murder and similarly tricked Morant into believing that Handcock had made a full confession. Could the real reason be that he was afraid of being called upon during the trial to account for his actions during the inquiry? His recollections of an encounter with Morant prior to the trials suggest that Morant, under close confinement at the time, was critical of his role in the investigations. The only reference to Handcock’s supposed confession is by Witton in Scapegoats of the Empire and by Major Bolton in a letter written on 3 April 1907 . The wording of Bolton’s letter suggests that he had never seen the “confession” but he claimed it was referred to constantly at the trial. That in itself is strange given that he was the prosecutor at most of the trials. In any case, Bolton’s 1907 letter dealt with compensation claims in the “8 Boers” case and it’s quite reasonable to accept that Handcock may have confessed to these shootings and the shooting of other prisoners in the belief that he was acting under orders. Bolton made no mention of a confession to the Heese shooting. Neither The Times report nor any of the available Judge Advocate General documents make any mention of a confession by Peter Handock. 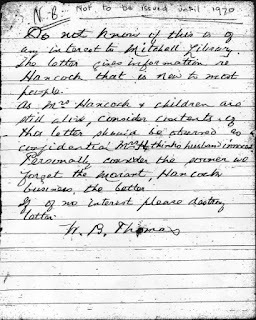 In his letter Witton speculates that Morant and Handcock “got to work to frame up an alibi”. From the time of their arrest until the end of the last trial they were confined in different parts of the camp and under close guard at all times to prevent that very thing from happening. Even if they were able to confer briefly at times they would have required the services of a third person to gather up and coach the necessary witnesses. The only person they could have possibly had an audience with, out of the earshot of their guards, was their lawyer Major Thomas. This is a factor that seems to be overlooked by many historians. If a confession existed then Thomas would certainly have been aware of it and all of its details because it would have been central to the prosecution case. Unlike the other trials Thomas actually had ten days to prepare his defence for this one and he would have gone through every detail of any confession with the accused. Thomas was no fool and he would have seen through any attempt to “frame up an alibi”. The later reactions by Thomas to the injustice of the verdicts and sentences and his firm belief in Handcock’s innocence clearly show that he was not a party to any fabrication of evidence. The War Office confirmed that the prisoners were refused leave to visit each other , and that written communication between them was censored . In the above mentioned filmclip by Frank Shields he states "One can only imagine the impact these revelations had on Thomas, it can be all summed up in the note he attached to the letter." As I've already demonstrated Thomas didn't attached the note and I believe that any impact the letter would have had on Thomas would have been one of severe disappointment that Witton had gone to water over the matter. Witton goes on to write that “…the shooting of Heese was a premeditated and most cold blooded affair. Handcock with his own lips described it all to me”. This could be a half-truth used to support his previous insinuations. Of course Handcock described it all to him – he was the one who found the body at the scene of the crime and it may have been Witton who helped him compile his report describing the scene to Taylor. Handcock would have needed assistance due to his poor literacy skills. I realize that Witton would know the difference but by phrasing it this way it does enable him to avoid telling an outright lie. Once again, if Handcock had genuinely told Witton that he had killed the missionary then why didn’t Witton come out and say so instead of using ambiguous insinuations. It can only mean that Witton wasn’t at all convinced that his memory of events was accurate and reliable. It is obvious from Witton’s book and the War Office correspondence that there was no opportunity for the prisoners to converse freely from the time of their arrest until the end of the Heese court martial. Much of Witton’s account of that period has been taken directly from The Times article of 17 April 1902 and to some extent from Frank Fox’s Bushman and Buccaneer which confirms that he had very little first-hand knowledge of events where he was not directly involved. (He was so unsure of his ground that, in the 1929 letter, he even asked Thomas if he could peruse the transcript of the Heese trial.) In his own copy of Scapegoats of the Empire Thomas wrote: 'This book gives only a superficial statement of the facts. Much that Lieutenant Witton probably did not know is not given. The true story of the Bushveldt Carbineers has never been written. These officers were truly scapegoats, shot or imprisoned not so much for their own sins but for those of the system of the militarism in which they were involved and which was responsible for the drastic instructions secretly issued from high places to irregular corps against the indomitable Boers. In the later European war regular army officers were not given the opportunity to season themselves by victimising colonial officers, as was the case in the South African war.' I have been fortunate to see this inscription first hand. The book is now in the possession of one of Thomas' relatives, Beach Thomas. Handcock was acquitted of Heese’s murder so it defies logic that he would later confess his guilt to Witton, or anyone else for that matter, when he still did not know his fate in connection with the other matters. He was still proclaiming his innocence of murder in the letter he wrote to his sister on the night before his execution. Movie plots can often leave us with a distorted impression of reality as script writers attempt to fill in the blanks. The movie “Breaker Morant” gives a false idea that the prisoners were housed together throughout the trials when in fact, as I have already shown, they were guarded in separate parts of the garrison. The Witton letter had only recently been made public so director Bruce Beresford included a scene in the movie where Witton, during the course of the trials, asks Handcock “Who do you think did kill the missionary?” and Handcock replies “Me”. There is no evidence that such a conversation ever took place. Craig Wilcox, who claimed in an ABC radio interview with Phillip Adams on 17 November 2009 to have seen the movie “about 200 times and watched it carefully often with pen and paper in hand” adds to the confusion by misquoting the scene. In an article titled “Killers Tale Murdered the Truth” he wrote ‘``It's wrong, Peter. You know it is,'' FitzGerald's Witton says to Handcock when the missionary's death is being mooted.’ That particular conversation actually took place earlier in the movie in a scene where Witton was protesting about Morant’s intention to shoot the Boer prisoners. It had nothing to do with the shooting of the missionary. "I want my character cleared, and I am going to try and get a strict inquiry into my case. I will not rest content till I am reinstated in my former position as an Australian citizen and soldier. I want to submit the fact to the people of Australia, and I feel satisfied that if they will interest themselves in the matter I shall get justice." Unfortunately that never happened. His book Scapegoats of the Empire barely caused a ripple and disappeared from sale, for whatever reason, around mid-1909. It seems probable that Witton was able to rationalize his not taking any further action because he believed there was a confession implicating him in the shooting of Heese and therefore he could persuade himself that he was the only real victim. The fact remains, however, that there is no evidence that such a confession even existed. Only those with a naive and simplistic understanding of the human psyche would fail to acknowledge the distinct possibility that George Witton developed a false or distorted memory of conversations that took place nearly 30 years earlier. “The shock release of Witton’s 1929 letter to Thomas seemed to put an end to the argument about whether Handcock shot the missionary, until one understands that Witton had good reason to want to silence Thomas, who had just been made bankrupt and had been struck off the Roll as a solicitor, and such a letter, which was never intended for release, would certainly have, and did have, the desired effect”. “Witton’s previous writings and statements had been the very antithesis of this letter to Thomas, and the motive for this new attitude is difficult to fathom. Whether it was a genuine conviction of Witton’s, a move to avoid the matter becoming too public again, a wish to reinforce his own bona fides, or to avoid public involvement with the now fallen Thomas, is all conjecture. Apart from the disgraced and recently-imprisoned Thomas, none of the other major players were still alive in 1929 to support him and Witton’s wife was seriously ill with cancer. Whatever his reasons, it is clear that Witton did not want the matter resurrected. We’ll never know to what lengths he was prepared to go to prevent that from happening. Vaguely worded insinuations in a letter written 27 years later hardly represent evidence capable of altering history. When addressing the Parliamentary Standing Committee on Petitions on 15 March 2010, Craig Wilcox claimed that he has a “historian’s general concern about revisiting the past, not just to reflect on the past but in an attempt to change it” but in that same address, in reference to the Heese murder, he says that “historical record turns up that in fact they were responsible for that particular killing after all”. I find it astonishing that he and other historians are prepared to declare that a private letter, written so long after the event and containing only ambiguous hearsay claims which cannot be tested, is alone a “historical record” capable of overturning the not guilty verdict delivered by the court-martial.